It’s Time D-Heads! The Feast of Fools is about to begin as we welcome Clopin the King of the Gypsies, PAUL KANDEL to the show! 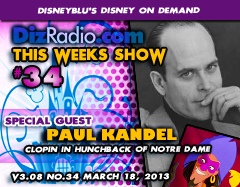 Paul was the voice of Clopin from The Hunchback of Notre Dame. Paul is stopping in to talk about being part of this fantastic Disney Animated Feature, what is was like recording the music and bringing this Gypsy to life! We have the D-Team back with Lexie going into the life and career of Paul, and Jason returns with The Vault digging deeper into Disney’s library of classics. There is a fairy bag full of Disney News hot off the D-Wire and Randy is back with Multi-Media for you. There is all kinds of magic and fun as we celebrate the Feast of Fools.